A friend of mine brought me a great present the other day. 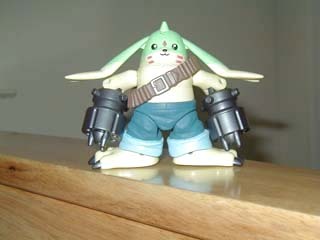 She lives in Japan, and she happened to run across a Gargomon D-Real action figure. I've had it for about a month now, and it's become one of my favorite toys. when you first look at it, Gargomon looks pretty small. He's barely 3 inches tall. He's about half the size of the tallet D-Real I have, Omnimon. 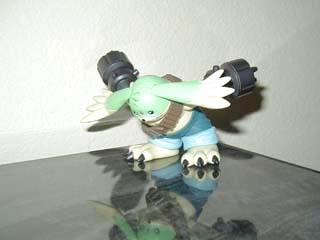 Gargomon comes with two gatling guns which can swivel in 360 degrees. His elbows also move up or down all the way. His floppy ears can also go up or down slightly. His big feet can be turned around 360 degrees. He can also turn on his waist 360 degrees. Unfortunately, that's about all he can do. His can't turn at all. There's no joint there at all. I guess because his head is so big, they couldn't find a way to put a small join in there. Also, because his gatling guns are so huge, he can't move his arms closer to his body. His elbows only have one joint so you can move the guns up or down, but no side to side. 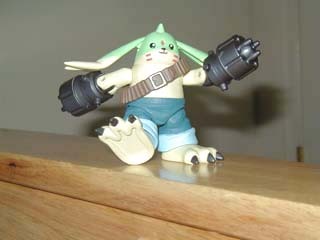 Gargomon's legs are very short, and because he's 'wearing' blue jeans, Bandai wasn't able to give him knees. You can kick his legs up or down, but they can't bend. On the bright side, Bandai really took their time to make this toy detailed. 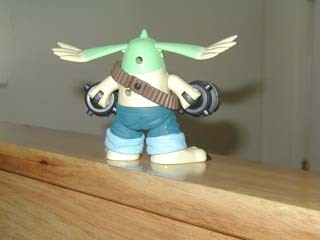 Gargomon looks just like he does in the cartoon, from his gun belt to his mask. His pants even have wrinkles in them. He looks like he came straight out of the cartoon. It's rare to find an action figure this detailed, this cool-looking. Very detailed. It looks just like the cartoon. The gatling guns look awesome. Very balanced. It'll almost never fall over. Not enough articulation. There aren't enough joints. This is better as a model than an action figure. Too small. If he was bigger, you could do more with him. The paint used to paint his head green is not very good. It flakes off if you're not careful. It's still worth the money. 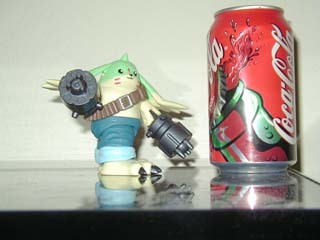 If you're a Digimon fan, you have to get this. It looks soooooooooo cool.